Grew Up… in an orphanage in rural Maine, in the town of St. Cloud. Dr. Larch, the director of the orphanage, made Homer his protégé and taught him everything he could about being a doctor— despite the fact the Homer never even went to high school. Living… on the Worthington Estate, where he moved after leaving St. Cloud's Orphanage. Homer wanted a chance to see the world, after being at St. Cloud’s for so long. 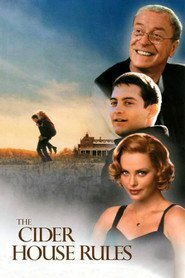 When the Worthington couple come by St. Cloud’s for an illegal abortion— one of Dr. Larch’s services— Homer returns to their home, to work in their cider house. Interests… experiencing life outside the orphanage. Homer’s learning the apple trade, and enjoying it. But his former experience performing abortions might be necessary before he knows it. Relationship Status… involved with Mrs. Worthington. With her husband off at war, they’ve started up an affair. She seems to see Homer as just as a fling, but he's deeply in love with her. Challenge… growing up. Homer has always been one person at the orphanage, and now he’s another in the orchard. But if he wants to move forward, he needs to reconcile his past with his present to figure out who he truly is. Personality… intelligent and caring. Homer was raised a doctor, with a doctor’s eloquence and also a doctor’s sense of responsibility towards the people around him. If someone is having a problem, or is lonely, or needs help, Homer can’t help but get involved— even if he thinks he doesn’t want to. Homer Wells's popularity ranking on CharacTour is #3278 out of 5,000+ characters. See our top-ranked characters and read their profiles.